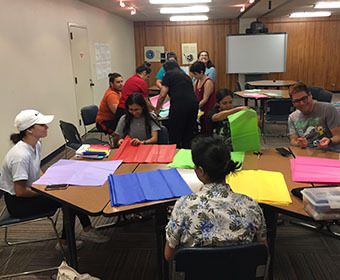 (Oct. 26, 2018) -- This Fall, the UTSA Honors College launched a new curriculum devoted to experiential learning that aligns with UTSA’s Classroom to Career initiative. Students in one course produced a new Dia de los Muertos exhibit on display now at the UTSA Institute of Texan Cultures (ITC) on the Hemisfair Campus. 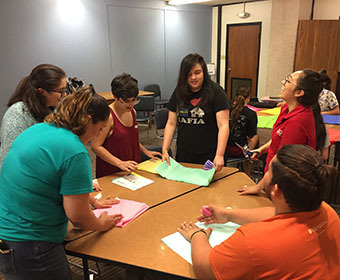 The UTSA Honors College's ethos is to help students develop concrete skills to apply and extend their academic knowledge in order to be more engaged citizens prepared for their next professional stage. >> Engage in experiential learning opportunities at UTSA. Honors’ upper division courses focus on interdisciplinary learning and one or more SPICES: Service, Professional Development, Intellectual Achievement (Research), Engaged Living and Skill Development. Each SPICES course emphasizes transferable skills through semester projects or civic engagements. The project or civic engagement activity is assessed by the faculty for academic mastery and by members of the community for professional or civic relevance and depth. The Fall 2018 Dia de los Muertos course falls under SPICES' Engaged Living. Led by Alegra Lozano, the students’ project with the ITC combines service to the community, deep cultural and intellectual exploration of concepts of tradition and remembrance, and skill development in museum curation and exhibit development. Fully designed by Honors College students, the Dia de los Muertos exhibit features a timeline, interactive pieces and modern and historical cultural elements. The centerpiece is a community ofrenda, or offering to the memory of loved ones, which includes an interactive digital photo frame. Anyone who would like to include a photo for the digital frame can either scan the QR code at the exhibit or email the photo to honors@utsa.edu. The exhibit is open at the ITC through Jan. 6, 2019. The San Antonio community is invited to an opening reception from 6 p.m. to 8 p.m. on Monday, Oct. 29, where they can see the exhibit and meet the honors students who created it. Learn more about the UTSA Honors College. Explore Classroom to Career learning at UTSA. Learn more about the UTSA Institute of Texan Cultures.